After much anticipation, the newly renovated Flo Cafe is open. I took a peek inside and it looks impressive--spacious, modern and buzzing with conversation. It was especially crowded last Sunday, as people enjoyed their weekend brunch. The menu has changed slightly, incorporating more serious dishes in addition to light cafe fare. You'll now find items such as steak, wraps and even sushi on the menu. The newest addition to the restaurant, the back-of-the-house outdoor garden is still there and connected to the main dining room. It's not yet open because of the cold weather but it'll be available once it warms up. Check out the new Flo and let me know what you think. The new, renovated Flo is beautiful! By far the best cafe in Astoria. The menu is great! They have a variety of different foods (the sushi is amazing! )and the prices are quite inexpensive. The drinks are fantastic and they now make frozen drinks, like Pina Coladas and smoothies! The cafe has a great vibe and a friendly atmosphere. The staff and service is wonderful. And its really nice to sit outside and enjoy a coffee in warm weather. The back (garden)bar is always exciting, listening to good music by the dj and enjoying a drink with friends. FLO has just been renovated completely and the decor is BEAUTIFUL! 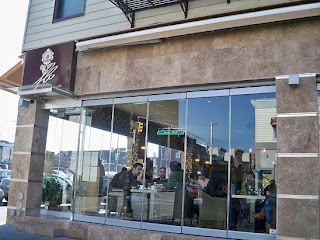 It is definetely the best cafe on 30th ave and in Astoria! Great review! Wonderful - I'll have to go see for myself.